This calendula flower is hand painted in rich, vibrant shades of orange in multiple layers on an emerald green background on a Moni Originals® 20mm charm. 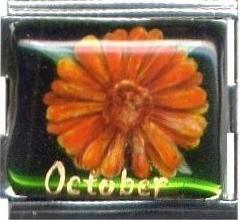 This flower is October's flower of the month. Additional Information: Can be ordered with or without the name of the month, just let us know in the Special Instructions field!